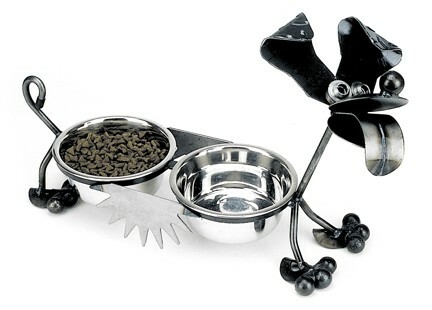 This unique dog feeder features a dog sculpture that has been made into a two bowl feeder. An excellent way to keep your dog dishes off the floor. The bowls also stay in place as a fit down the to the sculpture that holds them. A charming sculpture that is functional. Each of the animal feeders come with two stainless steel metal bowls. Each of these wonderful metal sculptures is hand made and will vary slightly from Sculpture to sculpture. They come naturally unfinished and will rust with age. If left outdoors rusting will occur much faster and the sculpture will take on a distinguished look, that many people prefer. If you want to preserve the natural steel look. The sculptures can be coated with a spray on clear coat finish like Krylon or a spray on Polyurethane to protect it from the rusting process. Made in the U.S.